Gerard Reynaert, R.I.P. (1925-2018) (EAP Flashes – 2018/08) | M.Afr. 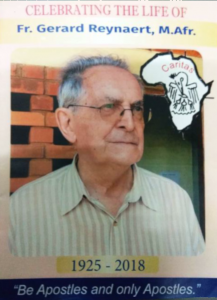 Gerard’s way of life corresponded well to the life that all Missionaries of Africa are invited to embrace: ‘Simple way of life’. He was a real Biblical Job: “Naked I came from my mother’s womb, naked I will depart.” (1:21) He departed from this earthly life “naked”; he left behind almost nothing! What a powerful message and legacy in a world full of greed of all sorts of earthly things! What a powerful message and legacy in a world where the “culture of grabbing” is on the increase everyday! Jokingly, Fr. Gerard used to speak of himself as “Ow’empisa ennungi” (someone with good manners). May we too, in spite of our human weaknesses, always aspire to be ‘abantu ab’empisa ennungi’ (people of good manners). Fr. Gerard was laid to rest at Nabulagala parish where he helped out for masses until his dead. The faithful together with some confreres kept vigil and celebrated several masses throughout the night praying for Gerard. The Archbishop of Kampala, his grace Dr. Cyprian Kizito Lwanga celebrated the funeral mass surrounded by a great crowd of people that came to bid farewell to jjaja (grandfather).